In the summer of 1974, Howard Ungerleider was sent to Canada by his company ATI (American Talent International) to help a new band as they started touring regularly. 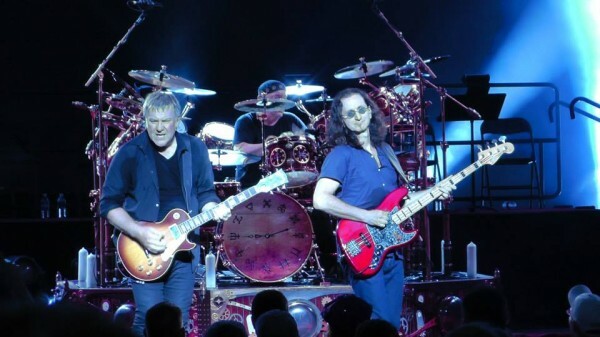 That band was Rush and Ungerlieder has played a crucial role in the success of their tours and production for nearly 40 years. For many years he wore the Tour Manager and Lighting Design/Director hat and has been on the road with Rush for every tour except the Roll the Bones tour (he designed that tour's production, but due to the success of Queensryche's Empire record, he was committed to continue that tour to it's completion). From the early days opening for Kiss and Aerosmith, to the breakout 2112 shows, the blockbuster success of the Moving Pictures tour, introduction of lasers on 1984's Grace Under Pressure tour, triumphant return and astounding South American audiences on the 2002 Vapor Trails tours, to the Time Machine, and the current steampunk-themed Clockwork Angels tour, Howard has been instrumental in the look and feel of the band's performances. While the band provides the all important soundtrack, Howard sets the scene and creates the drama with precise and powerful lighting and video cues. 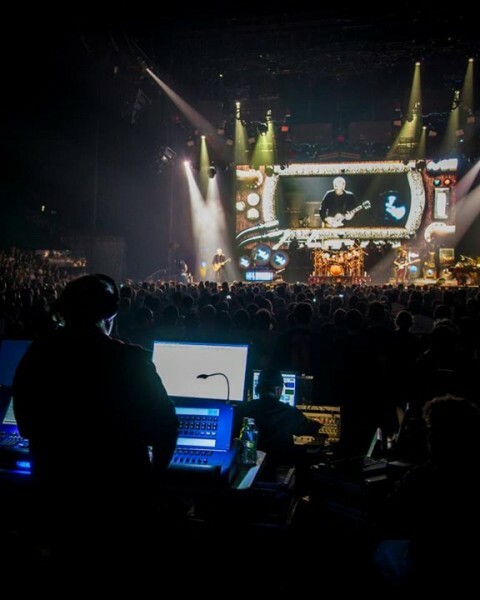 While Rush is the longest-running band Howard has worked with, he has designed or toured with countless other bands including Van Halen, Rod Stewart, Def Leppard, Star Wars, as well as music videos, films, corporate events, and architectural installations. He is the Designer/Principal for Production Design International, a lighting and effects company based in Toronto. I've been catching up with Howard for years going back to the Counterparts tour in 1994 for semi-regular chats and discussions on the latest lighting technology and design inspiration for various outlets including The Spirit of Rush, A Show of Fans fanzines, as well as fye.com [look for those previous pieces to find a home on the web here shortly]. 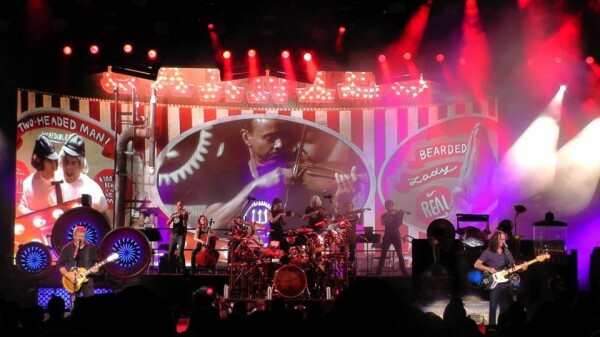 It had been a couple tours since we'd caught up so I wanted to make sure we connected on the Clockwork Angels tour to discuss not only the new tour theme and design, but the recent Rock and Roll Hall of Fame induction, as well as some of his favorite lighting designers that inspired him. As the rain poured down in sheets outside the Saratoga Performing Arts Center in Saratoga Springs, NY, Sound Engineer Brad Madix had just wrapped up testing the PA (with a live version of “Subdivisions” played in full on loop about 6 times) and Drum Tech Lorne Wheaton began meticulously testing the drums (which were experiencing a little dampness from the rain a couple nights earlier at Jones Beach). Amidst the on-stage banging Howard and I started our chat. Bp: Obviously the inspiration for this tour’s design was steampunk, but how did you translate that theme to the design we see before us onstage today? Howard: Neil came up with the steampunk theme. We knew it was going to be steampunk themed before we did Time Machine [in 2009]. We knew Clockwork Angels was going to be the name of it so I designed it based on that. I didn’t have a lot to really base it on because the book wasn’t out and I hadn’t gotten the lyrics. It wasn’t until a month and a half to two months before the tour started that I actually heard the album, in its raw state, before it was mixed in the studio. That was kind of cool. Alex invited me down to have a listen to a few songs and I wound up listening to all the songs. That was pretty good. I immediately knew that it was the best thing I’d heard in twenty years. So much so that I actually called them all up individually and congratulated them on it because I thought it was the most brilliant thing they’d done in a long, long time. The fact that it was a concept really was great. So following that I was talking to Neil and he sent me the lyrics and the storyline with a bit of an explanation. From there I was able to finish the design the way I saw it in my mind after knowing the story of Clockwork Angels. [The story] was excellent; amazing actually. Bp: How much of the design was in your head before you heard it and had the explanation? Howard: Well, the word angels spawned the idea for wings, which spawned the idea for the moving video panels which are the angel wings. I put that together right off the top. Then after hearing it I was able to embrace more of it with the whole steampunk and the storyline. The lyrics lend themselves to the effects. While I was actually brainstorming through songs like “The Wreckers” where it’s a shipwreck in the middle of the ocean during a storm, I came up with the concept of the pouring rain; to make it look like it was raining on stage with the video which is quite effective. It’s very theatrical. I love bringing the video together with the lighting. It’s always great when you can blend the two. Bp: It’s especially powerful on “The Wreckers” because there’s a 3-D effect with the rain on the screen, but also the lights are positioned as such they are simulating the rain as well. Howard: Yes, exactly. 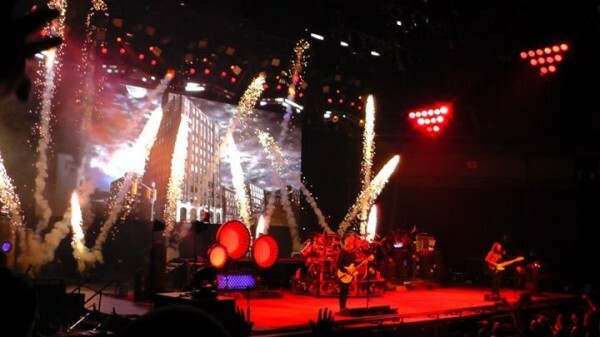 Things like that and on “Clockwork Angels” when he sings, “As if to fly…” that just lends itself to a nice lighting cue. It’s full of excellent lyrical imagery. Those things lent themselves, along with the music, to the development of the design and inspired what I was going to do lighting wise. Howard: It wasn’t even a rough mix. It was no mix. It was just the engineer in the studio putting up the track. Immediately, without even hearing a mix it sounded unbelievable. I’ve been here forever so I’ve heard every album, but this one jumped out. It was like when 2112 was done, that jumped out. When Moving Pictures was done, that jumped out. Clockwork Angels jumped out the same way. Bp: Do you come up with ideas as it’s rolling the first time? Are you seeing things in your head on that initial listen? Howard: Oh, it’s ongoing. I see it the first time and I revisit it and revisit it and as it’s moving along we update it and update it as we go. By the last show it looks spectacular. Then it all goes away and it’s gone. [laughs] And then we have to put a new one together for the next tour. That’s how it works. Bp: But those visual images for what you’re going to design start right from that first listen. Bp: At this stage of the game you’re pretty good at making things fit in the budget I’d assume. Howard: I don’t know, Brad. I think I’ve had the history of doing that. It’s alright. Bp: How long was the programming stage? Howard: Ten days. Tim Grivas is my programmer who I bring out and he knows what I like. I brainstorm and basically tell him what I want him to put forth and what I see in my mind and he does it quickly for me. Now I have Andy O’Toole who is my assistant out here. He’s taking over for Matt Tucker who went to do Beyoncé. Bp: When you’re working with Tim on the programming have you sketched things out or are you verbally giving him direction? Howard: I force him to stay up late and he hates it. [laughs] Basically what I do, I’m a slave driver, I know what I want to accomplish and I know what I have to accomplish. We can’t really start until after the band finishes. The band likes to rehearse at show time so they rehearse starting at 7:30pm and they’re finished at quarter to 11. Then we start at 11 o’clock at night and we go straight through until 10 in the morning, every day for ten days in a row. Then I force everybody to come back at 3 in the afternoon so we can get the lights fired back up and I can run through all the cues that I did so I can memorize them. Then the band comes in to do soundcheck and we run the cues with the band. When the band plays if I have three songs then I’ll run through those songs and then put the lights back up to white and they’ll finish out the rest of the night. Then every night I’ll run through more songs. We’re up for about 18-19 hours a day, something a lot of people hate. Howard: Oh, very easy. It’s very labor intensive. It’s not an easy thing to do. Howard: Here’s the process. We run live tracks and what I do is play the track for him so he’s familiar with it then I say, “And here’s what I’d like to see…” And I’ll say, “I want to see this here. I want to see this happen here. I want to see these lights do this and that, followed by a sequence and an auto-follow that does this in a certain amount of time so it’s just the perfect timing and then I want to override it manually with all these things.” Then he says, “Ok, let’s start at the beginning and get doing it.” Then we put it in. Then I have to memorize it. That’s a big part after it’s all done, memorizing it. Bp: Because you’re triggering all of the cues. Howard: I’m triggering everything, yes. I’ve created the show. I’m directing the show. So yes, I’m running the console. I’m calling the spots. I’m running media servers that trigger video cues that go in through the lighting console, plus there’s pyro in the show. You’re doing a lot of talking during the show. I’m like an air traffic controller. Bp: And you’re also doing the cues that are not pre-programmed. Howard: Right. Which are many. Bp: What’s the percentage of those that are manual as opposed to the ones that you are triggering and letting run. Howard: I would say 60/40. Howard: 60% programmed, 40% manual. Bp: That’s a lot of manual. Howard: It is a lot. Bp: What’s your favorite part of the process: the initial design; the programming; or the execution? Bp: Are those production numbers the ones that when you’re on the road are the most fulfilling? Howard: Oh yeah. Definitely those are the ones that are. But all the songs are, I’m emotionally attached to all of them because they’re all created from here [touches his chest]. Like I was saying, once they’re done and you have…it takes me 7 to 10 shows before it gels as a total work; what I call a piece of work. You start to look at it content wise, what you’ve done, and then you make changes. If you think you don’t like something or you think you can do something better, then you make changes. You add, you take away, and you change things. By the time show ten comes around then you just continue to change things and you’re constantly adding and adding. By the time the tour is over you’ve added everything and it goes away. Bp: But you’ve got the memory. Howard: Right, you’ve got the memory and now you’ve got the DVD. So it’s stocked away in the archives. Howard: That’s Geddy’s brother. He does a good job trying to get the whole show. I usually watch the DVD once and that’s it. Bp: Well, you’ve lived it how many times by that point. Bp: So obviously the moving angel wing video screens were inspired by the Clockwork Angel wings. How did those come together? Howard: I made it come together, Brad. I actually thought that I’d want to have video of it so it was just making people understand how I wanted to make use of it, the content makers - Ged’s brother and everybody. It’s a painful process, but it’s my vision, it’s not their vision. They have a completely different vision. Their vision is they’re making movies. They are like filmmakers. But for me, the film has to fit into the show. So I’m concerned with coloration and how it comes on the screen. They are used to having things projected and these come through an LED wall; completely different concepts. So there’s a lot of thought that has to go into how to blend the video into the lighting and how to make everything work. I have the opportunity to talk to the content builders about color and how I’d like to see the colors; how I’d like to see it come out of the black, or appear, and how it blends into the show. That’s part of the magic of the production. Bp: It provides a nice 3-D effect on this tour as they are at different levels, especially something like “The Garden” which looks amazing. Howard: It’s surreal, I know. I’m happy. This is one of my favorite rigs I’ve brought out. Bp: Were there any concerns with so many moving parts? You’ve had moving trusses in the past, but not to this extent. Howard: I don’t really have much concern about the moving parts. They work. It’s how to lay them out. It was the whole layout of them, where they should be, how they should interact with each other. That’s all the things I really needed to think about when I designed it. Then I go to the rigging company and they tell me, “Here’s how we have to do it. Here’s how we have to make it look, so maybe these things need to sit a little off-center from where you wanted it. Is that ok?” I’m like, “Sure, as long as it clears this and clears this and is safe.” Safety is key. So that’s pretty much how this all comes together. I pick and choose my equipment based on what I need for the songs both lyrically and visually. That’s how I come up with the instruments I use in the show. Those are chosen for those reasons. Bp: What are those on this tour? Howard: Some of the LEDs are Robe Robin 600 which are the side wash that are in the triangle, Spectrum manufacturing makes the color for us. 48 LED fixtures which I’m using on the Chevron’s on the bottom. The squares are made by PixelLine those are Maxi Brights, which is not a product that’s on the market – it’s a prototype that I’m using. I’m using Vari-Lite VL3500 and they are a hard edged fixture. I’m also using a High End Systems Showguns and High End Systems Intellspots for my hard edged fixtures. Showguns are on the floor, those are the 2000 watt fixtures that are hard edged and are like searchlights. And I’m using Coemar 1200s for all my other wash fixtures. I’m also using Coemar Infinity ACLs for my aircraft landing light effects. That’s basically the rundown. I have ten spots in the system, four front of house, six on stage, they’re Lycian M2 spotlights 2.5k. I’m also using some small LED fixtures that are in the 3200 range, which is sort of like a tungsten color to uplight Geddy’s backline and a few Martin stage bar LEDs to fit inside some of the props. RSC light locks which are like the gyroscopes, RSC stands for Royal Shakespeare Company - designed for them, and I have a dozen of those in the system on pods that drop in as well as the screens that drop in. Everything runs through High End Systems Road Hog 3 Full Boar consoles. That really sums it up. Bp: It seems like compared to tours in the past where you were using more of one company’s gear that you’re using a much wider array of fixtures from a number of different companies. Howard: Yes. I’m staying on top of the latest technology. I like to use what I think is necessary to make a good looking show happen. I choose the fixtures based on that. Bp: When you’re initially creating the ideas for cues in your head are you doing that with fixtures in mind or are do you come up with effect and need to find a fixture that can execute that? Bp: Have you ever visualized anything in your mind that you couldn’t find a fixture to accommodate that vision? Howard: No, never. There’s always going to be a fixture to do it. And if not, you make one. Bp: Have you had to do that in the past? Howard: I’ve had to do some makeshift stuff in the past. I’ve had special consoles designed. I’ve put light bulbs that didn’t exist in PAR-cans in PAR-cans before, things like that. Yeah, I’ve done that. That has driven people crazy. I made my crew one year put up 158 lights surrounding one of my rigs and I only used it for 22 seconds and they hated that. Bp: What was that for? Howard: That was for “Countdown.” It was the light that surrounded the whole system that were on as the Space Shuttle launched. I heard about that for years, “You made us hang those every single day for 22 seconds!” “Yes. I did.” [smiles] I used to make them focus in the trusses with headsets on and they used to hate that too. Bp: Someone asked me when I mentioned I was going to be talking to you to ask why the really effective truss drop during “YYZ” only happens a couple of times in the show when it’s so effective. And I knew from our previous discussions that your philosophy is that you won’t show an effect five or six times because it loses its impact when used repeatedly. Howard: Basically it moves three or four times during the course of the show, they’re just not always aware of it. “Limelight” it tilts down at an angle as well. I drop it down at that moment [in “YYZ”] because that is the moment I feel it needs to. There’s not another moment in the show where that needs to come down. Bp: It’s a powerful moment when it comes down. Bp: It goes to the 22 seconds. It’s more powerful once. Howard: They can go see another tour if they want to see that. I treat it almost like a theatrical production. It is as far as I’m concerned. Bp: It definitely builds like one. Howard: It is a rock tour and theater directors would argue with me on it, but I’ve done theater so I know. When you’re presenting a rock opera, which Clockwork Angels is, you want it to be flow like one. You want it to read like a rock opera – like a play. Thus the rain effect, which will blow everybody away, including the theater directors. I’ve actually had the Cirque de Soleil guy comment to me about that. Everyone does. Everyone is blown away by it and it’s so subtle. Subtle, but powerful and in 3-D.
Bp: There are a lot of 3-D-like moments in the show, helped by the screens because they’re hung at different depths. Howard: I designed it that way. That’s the beauty of it to give it that depth. You want that stage to look like it’s 100-feet deep, if not more like a mile. You’re looking into it as far as you can. Bp: Was it a challenge and did you have to think differently with the addition of the strings? Bp: And where in the process did you know about that? Howard: I knew about it as soon as the band decided it. It was way before the tour and I was told to keep it a secret. That’s why there are four triangle trusses up there – I use two in the back and two in the front so I use the two in the back to light the orchestra. Sometimes I’ll use it on the band when I’m not using it on the orchestra, but that was what that was for and some of the back lighting as well. That was penciled in there just for that reason. Howard: There was a big debate on that. It went on for a few months. Eight months before the tour started we were coming up with all sorts of questions, “What do we do with them? Do we put them on a riser? Do we make them come off the ground? Do we put them on this?” We finally came up with a concept. There were about six of us involved in making that decision [laughs] until it finally worked. Bp: It’s nice because you’re not disrupting the flow of the normal Rush stage. Howard: No. And that’s one of the things that we were worried about. It keeps them in the background where they are and it also adds another dimension to the stage. You’ve got the screen, them, and the band. So that’s now your third dimension really. I think it works really, really nicely. Bp: Were there any safety issues with the pyro and effects having to push that further back than normal to accommodate the string riser? Howard: No. The pyro company deals with where they have to place things based on where the orchestra was. The string section was a bit freaky initially. They thought they were around in the middle of a war zone, which is understandable. Bp: Did you have any visuals in your head for the Clockwork songs that they aren’t playing this time around? Howard: Yeah, but most of them made the cut. Bp: Were any of those effects ones that you could use elsewhere in the show or were they specific to lyrics or those songs? Howard: No. They were lyrically specific. But that’s ok.
Bp: Do you keep those tucked away in the event they can be used again? Howard: No. They’ll never be used again. It’ll be a new tour with new tricks and a different situation happening. Howard: I don’t know. Are they talking about touring again? Yes. They’re talking about possibly touring in two years. But there will be nothing again for two years, we know that. Bp: Would that be a new album or R42 as Geddy has mentioned, do you know? Bp: Would you rather design around a new album or another anniversary tour, or don’t you care? Bp: You’d say that after you fainted you mean, right? Howard: No, no. I wouldn’t be surprised by anything they say, but yeah, I don’t think that will happen. Bp: Speaking of impossibilities, are there songs from the past that you’d like to design for with today’s technology? Howard: Yeah, I’d love to do “Jacob’s Ladder” which would be great, but they nixed it on this tour. That would be nice. I love “Animate” – that’s one of my favorite songs to light. Bp: That was always a powerful one. Howard: Yeah. I’d love to do “Anthem” again, but unfortunately they’re not playing that. Bp: At least they ask! [laughs] Are there other songs you’d like to revisit and design again? Howard: Sure, lots. I like “Show Don’t Tell” a lot. Bp: I wanted to talk about the Rock and Roll Hall of Fame for a few minutes, first of all, congratulations to you and the band. For the actual ceremony itself, how much, if any, was your design or rig? Howard: None. It was the show rig, like for any awards show. Basically I couldn’t even operate it. So I had to talk to a guy named Felix Peralta and Alan Brandon, the designer of it, Felix was his programmer, I told them what I thought it should look like and they did what they could pull together to replicate my ideas. I just sat there to make sure it looked good. That’s about it. Howard: No, it wasn’t my show, but it went fine. Bp: Was it weird to see them perform with you not behind the controls? Howard: No, it wasn’t weird. I mean, I’ve seen them perform before without me running lights – the Colbert show, stuff like that. Bp: Not many times though. Howard: No one’s going to come close to this anyway, so. Bp: Right, but on such a big national stage I guess is what I mean. Would you rather have done it? Howard: It would have been nice if we had our rig, but it wasn’t our show. We were just one of many people there so you couldn’t expect that. It’s like when you play a festival. A lot of times you don’t have your rig. We had our rig in Sweden, but that’s unusual. Most festivals you just go on and you don’t bring your rig – it’s just a generic rig for everybody to use so you’re not going to get anything spectacular. You’ll get as much as you can. You don’t have much programming time. It’s tough. Bp: Was it a fun weekend to be part of? Bp: So congratulations to you as well! Howard: Thank you very much! It was spectacular. I didn’t realize how many people were going to be there; Jack Nicholson was there, Oprah Winfrey was there, y’know. I knew the inductees and that’s pretty spectacular. I didn’t know that Jackson Browne, John Fogerty, and Tom Petty were going to show up as guitar players for Randy Newman. That was kind of amazing. Bp: Not a bad set of hired guns. Howard: No. It was all good. I got to meet Dave Grohl which was excellent and Taylor Hawkins. I hung out with those guys for a few days over the rehearsal time period. It was a lot of fun. Bp: A nice way to celebrate almost 40 years. Howard: Yeah, well, they deserve it. They deserve to be in there. It’s mind boggling the people who are not in there still: Deep Purple for instance. They should definitely be in there. Bp: While you didn’t perform on the albums, your production and designs were instrumental in not only their early success on the road but their continued success through the years, so congratulations on that! From a production standpoint, you’ve been the guy. Howard: Thank you. It’s been a fun ride. It still is. Hopefully it will continue. Hopefully we don’t have to get off it soon. [laughs] Or get off the ride. Bp: When you started and were sent by the New York company up to teach the band how to tour, you had lighting experience at that point, right? Howard: I did. I’ve always had lighting experience. I worked with lighting when I was very young. When I was in high school I did all the shows. Anytime they had a play I was the one running the lights ‘cause no one else knew how to do it and I was very curious about it. I read books on theater lighting and it held my interest. I just enjoyed it and that’s how I started it. I learned how to patch lighting and how it worked, how they controlled it. Back then it was archaic. Back then it was controlled by these things called ‘piano boards’ that you’ve all seen, or maybe you haven’t, you go into the old high schools and there were these big dimmers that had twist locks on them, you’d pull them up and down. Actually one of the first Rush shows, at the Michigan Palace, I used to have five guys on one of those piano boards. There had to be about seventy different levers on it and they all locked in so you’d have groups of people locking down switches and then throwing the big master. It took two people sometimes to do the crossfades. It was amazing. It’s incredible how far lighting has come and the board changes now – a far cry from there. Bp: Who were some of your early Lighting Designer influences? Howard: Chip Monck. I thought he was amazing when he took the mirrors and put them in front of the Rolling Stones one year and shot spotlights from behind the stage into the mirrors to come down on them. I thought that was unbelievable. I don’t know who the person was who did the original Pink Floyd, I know it was not Mark Brickman – it was someone before him, whoever did the first few Pink Floyd shows were spectacular [Arthur Max]. That really got me very, very interested in special effects after seeing that show at Carnegie Hall. That was a pretty amazing place to see Pink Floyd. Bp: When would that have been? Howard: That was in the very early ‘70s [May 1972]. That was really what set me off in production and wanting to do things like that. Traveling as an agent on the road with a lot of bands before I worked with Rush I must have worked with fourteen or fifteen different groups through the agency. I remember the agency represented sixty groups at one point in time - it was called American Talent International. I had the opportunity to travel with bands, meet them, and speak with them. Bands like Fleetwood Mac, Savoy Brown, Deep Purple, Rod Stewart, Badfinger, Brian Auger, Todd Rundgren, a lot of people. All of that occurred before Rush and that gave me a little bit more insight in production. A lot of these acts asked for my help at times and I helped them build their shows up. It was interesting. And here we are today. Bp: Any other impressive shows that stand out in your mind? Howard: Supertramp had a great show on the Breakfast in America tour and Crime of the Century album. I love Supertramp, they were great. The Who always had a great show. David Bowie’s shows were impressive to me when you’re talking about the old school acts. Yes as well. More recently Radiohead’s show I loved. That was very beautifully executed. Peter Gabriel has always been really great. Those are a few of the shows that I remember aside from the Pink Floyd’s that have always been creative and great. Bp: Any memorable Rush designs that stick out to you? Howard: Moving Pictures was great. I think it was one of the first tours I was given enough money to work with to pull off what I needed to. There’s so many of them. Hold Your Fire was a great one as well. I loved Vapor Trails and Counterparts, all of those designs. Snakes & Arrows was one of my favorite ones. There’s a lot. If I reflect back on all of them, they were all different. And that’s the one thing I pride myself on, every single design I’ve created for Rush for every one of their albums has been different. 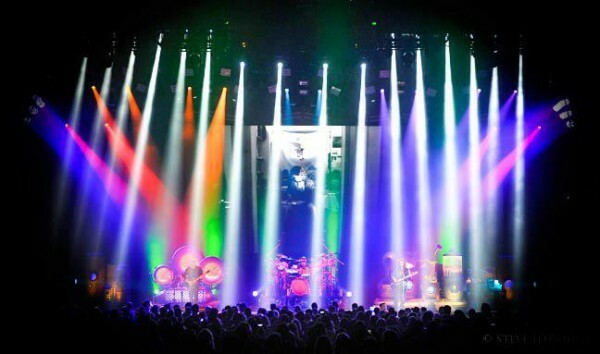 You’ve never seen Rush with the same lighting rig ever. Bp: And you can always tell from photographs, notwithstanding Neil’s bass drum cover, which tour it is based on that design. Howard: For sure, yeah. Hopefully it’s been a positive evolution. Bp: Was it nice to revisit the Power Windows material on this tour? Bp: What have been the worst horror stories? Howard: Rochester was my worst horror story. When we played there at the auditorium and the show was about to start and as I called the house lights and the place went dark a huge Big Gulp came over in the air, flipped upside down and doused the complete lighting board and we had to do the whole show that night with just spot lights only because all of my consoles, including the back-up, were flooded with ignorance and a Big Gulp. Bp: What tour was that? Howard: I can’t remember what tour that was, but it was way back then when I had my new Electrosonic board that I loved so much. I had two of them and they were useless after that. I had to get two new ones. Howard: Yes, I was less busy and very upset. I was young and I had a very bad temper when I was young. Aside from that it’s all been pretty good I have to say. There was one year when one of the speakers fell out of the ceiling and sliced Alex’s double-neck in two and missed one of the guys on stage by a few feet. That was horrible. That wasn’t a great night, but aside from those two things, I can’t remember…oh yeah, there was a night I can remember. There was a murder in San Antonio on one tour. Somebody got murdered in the audience. It was general admission and when the show was over and house lights were up, everybody had left and there was a dead body lying there. That wasn’t a great night either. Those are some of the down nights. Bp: What were some of the best nights? Howard: They’re all the best night. We’ve had a lot of fun. We used to play the Midwest quite a bit and we toured with Kiss. Those were good times. Those were great times. They would always throw something out of the window of a hotel…that wasn’t a great thing, but there was always some excitement to deal with. Traveling in limousines with Ace Frehley was always fun. I remember that. I remember a lot of the opening acts were pretty cool and some of the bands we had to open for through the years were pretty ignorant. A lot of bands were afraid of Rush when they first came out because they were so intense. And they went over so well there were some insecure ones, I won’t mention their names, and they sort of liked to turn the PA system down and not let them have soundcheck. But those days are gone. Rush have always been gentlemen, they always treated their opening acts well. Howard: Y’know what? That’s funny because we don’t remember any of that. I don’t remember that happening and I have a pretty good memory. I don’t remember anything like what the Runaways said happened. I know the band went on stage to watch them, but I think that was more in their heads than what really went down. Rush were not like that. They never were. Bp: You would think that you’d hear more if it, if they were. Howard: Yeah. I don’t believe what they say is really true. I just think it’s something, their perception of what happened and what really happened are two different animals. That’s what I think. Bp: Any show highlights over the course of the 40 years? Howard: The shows in Brazil when we first went there were pretty spectacular. When you’re sitting there and you’ve never played in a country before and 70,000 people turn up it’s shocking. Especially if you’ve never done that before. Rush have always been an arena act. They’re used to 15,000, maybe 22,000 when you do an outdoor amphitheater and the lawn fills up, or something of that nature. I remember playing in Texas at the Texas Jam. It was one of our biggest shows ever and it was about 38,000 I think came to that, it’s kind of awesome. But when you see 70,000 people it’s pretty amazing. That was a really great experience. Bp: I remember talking to you after that string of dates in South America for a piece on the Rio DVD release and you were blown away by the crowds, but that there were many production nightmares. But the shows were amazing. Bp: For many you are. Howard: Without the music there’s no lighting. Bp: But for your company there is, ‘cause you do a lot of architectural work. Howard: I know we do. Bp: But in this sphere you’re right. I know what you mean. Howard: I know, I’m just saying. And any band that is looking to have a show created for them, they should call me. I love to do other bands as well. Bp: You just had some items out with Tool recently. Howard: We just did a month with Tool. We had a laser system out in Asia and we did Australia, New Zealand and Japan. We’re out with Kid Rock now. Whatever happens in the fall that we pick up as well. Bp: Are you only physically touring with Rush? Howard: No. I’ll tour with anyone that wants to hire me. It’s just the fact of the matter that sometimes people don’t know I’m available. They just think I’m always with Rush, but I’m not. I’m out there and I love doing new projects and younger bands or things like that. Howard: We do corporate gigs. We do architectural gigs. We do a lot of multimedia presentations as well. Bp: Like you said before, just give you a canvas. Howard: That’s right. We’ll come up with a multimedia extravaganza. Howard: It’s how you use it. You can either use it or abuse it. Sometimes it’s knowing when to use it and how to use it. Bp: Exactly. I think you’ve perfected that over the course of your career. Howard: I do my best. [laughs] Let the masses make their minds up. They seem to like it though, they clap a lot. Bp: You always seem to get a lot of people stopping by on the way out after shows. Howard: I do. Actually I was freaked out at the Rock and Roll Hall of Fame ‘cause I’d come out of the hotel and the only way in the building was through the stage doors which was the only way I could come in with the pass I had. When I came around the blind corner to get to the stage door I hit the red carpet where all the actors and musicians come in, which was the only way to get in, and as soon as I hit the red carpet there were all these Rush fans and a lot of them were screaming my name. It just caught me off guard. Even the cops and the security that were out there were like, “Who is this guy?” They sort of ran towards me trying to figure out why they were screaming at this guy. Then I just walked in, but it was kind of weird to me to turn that corner and for a moment, for my 15 seconds there. I wasn’t used to something like that. Bp: Well, for a lot of fans you’ve always been there and a face they always see on the way out. Howard: I guess so. I’m the closest thing that they get to the band. Bp: You put on an excellent performance every time they do. Check out more on Howard and Production Design International on the web or on Facebook. Special thanks to Howard for the interview; Meg @ SRO; and Cameron Crowe for the inspiration. This was a fantastically informative interview. 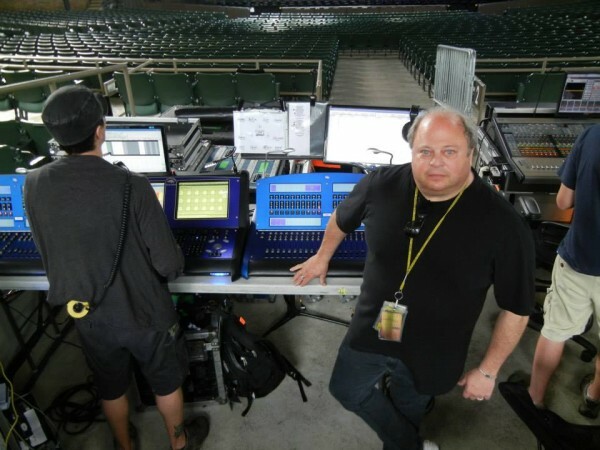 I learned so much about what happens behind the scenes; I wish I'd known before the Clockwork Angels tour so I could have seen the production with all of this new knowledge! I was actually at that same SPAC show; thanks for embedding the video to The Garden. Lovely.